January 2008 While in Singapore last year, I had intended to visit the Republic of Singapore Air Force (RSAF) museum but ran out of time. So when I returned to the country again this month, I made a point of visiting the facility soon after my arrival. 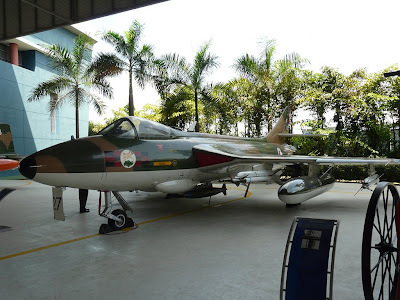 Compared to other air force museums elsewhere around the world, the RSAF's facility is a modest but modern building adjacent to Paya Lebar airbase. The front of the building is guarded by a Douglas A-4 Skyhawk, a Hawker Hunter, an Aermacchi S-211 and an SIAI-Marchetti SF-260. All four types served the RSAF faithfully for many years. The above photo is of the SF-260, which I knew well. I flew Noel Kruse's machine for a few years before it was badly damaged in a crash landing following an engine failure after take off. 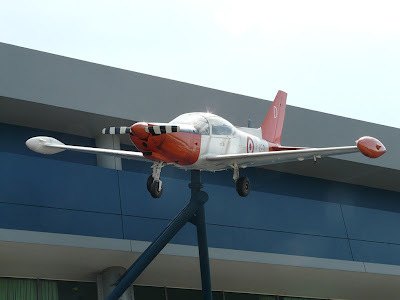 That bird (VH-ARV) was rebuilt and bought by someone in Queensland. Duh! 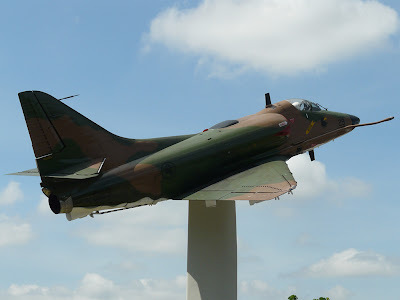 I forgot to take a picture of the S-211, so I'll move on to another interesting beast - the Hawker Hunter. In the 50s and early 60s, this bird was to British fighter pilots, what the F-86 Sabre was to American fighter pilots. When I first learned to fly, my training was conducted by a former RAF fighter pilot, Roy Garthwaite. He flew Hunters in Germany during the Cold War, and had many interesting stories of near shooting dogfights with Soviet Bloc fighters. Roy also used to go on about the Hunter being a fighter pilot's fighter. Some years later, my aerobatics training was conducted by a former RAAF fighter pilot, Noel Kruse. He flew the Australian version of the F-86 Sabre, the CAC Sabre. Noel too, believed the Sabre was a fighter pilot's fighter. Interestingly, both the Hunter and the CAC Sabre rivals were powered by the Roll Royce Avon engine (with the Hunter having a higher thrust version). The gate guardian above is the Douglas A-4SU Skyhawk. Unique to the RSAF, the SU model was an A-4 re-engined with a non-afterburning General Electric F-404 engine (similar core engine as the F/A-18 Hornet). A then new avionics package was also fitted to this version of the bird. 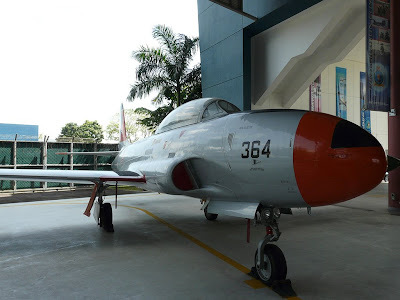 During my visit, I was surprised to learn that the RSAF also operated Lockheed T-33 Shooting Stars for four years. These ex-French Air Force birds were a stop gap measure until the Aermacchi S-211s arrived. And after about 23 years' service, the S-211s have themselves been replaced by the Pilatus PC-21s. As I salivated over these beasts of the air, I found myself wishing that I owned an oil refinery and an aircraft maintenance company. Nothing would please me more than to have these birds as my personal toys to blast around the sky.